To be perfectly honest this isn’t the type of music that’s normally high up my list of things to listen to; but tracks from Devil In The Seat have gradually filtered into my consciousness over the last few weeks via the ‘random button’ on my i-Phone and I’m on the verge of becoming a convert. Opening track Stillhouse is a 100mph frantic Square Dance tune that has had me smiling every time I’ve heard it and later Chicken Reel has had a similar effect and both make me wish I had the ability to dance to them. Even for someone like me there’s no denying the quality of musicianship among all four members of the Foghorn Stringband; and if this album has a weakness it’s only because this music is for dancing to and not really for listening to in the comfort of your home; although the duet on the Country-Gospellish Longing For a Home; coupled with some delightful mandolin playing is very pleasant indeed and bares repeated listening. Similarly 90 Miles an Hour with some darn pretty and the band giving it everything they have, is an absolute joy; and must be a highlight of the bands live performances. 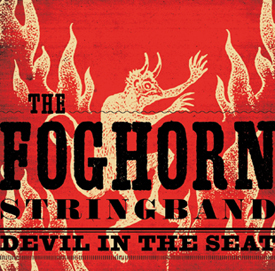 This is Foghorn Stringband’s 8th album and they incorporate all kinds of influences from the world of Country and Folk music; with Irish/Scottish jigs accompanying Jug-band melodies on some tunes; and as I said earlier absolutely everything is of the highest quality making this a ‘must have’ for existing fans; but also easy on the ear for passing strangers like myself.